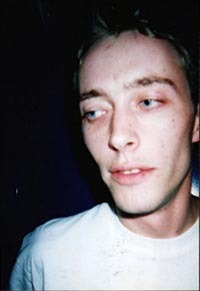 Bryan Michael Mills (born 16th March 1972) was The Divine Comedy’s bassist from October 1994 to November 2001. He was born in Northern Ireland and went to the Portora Royal School in Enniskillen as did Neil Hannon (though he was one year below Neil). In the late 80’s, he led a heavy metal band, Lady Macbeth, with Ivor Talbot. In 1994, Bryan was living in Edinburgh, in Scotland. On day in the summertime, he received a phone call from Neil - they would usually phone each other. Neil was in town. They went out for a couple of pints. A short time later, Bryan phoned Neil back and asked him whether he could play the bass for The Divine Comedy, though he’d actually never played that instrument before. He learnt the bass and, in October, played his first concert with The Divine Comedy at the Théâtre de la Ville, in Paris. He then continued to perform with the band, live and on the studios on the albums Casanova, A Short Album About Love, Fin De Siècle and Regeneration. The same year, Bryan joined Anthony Reynolds’ band Jacques (another labelmate band). Anthony remembers: “He was recommended to me... I’d kind of met Bryan, a couple of years ago - we did a Jacques tour with The Divine Comedy - but although we’d speak to everybody we didn’t go out to dinner. Bryan was recommended by the record company, Setanta - and he’s a lovely guy, really mellow.” . Bryan also introduced to Anthony Reynolds a new drummer, Paul Cook; Anthony: “He was recommended by a bassist that I had also worked with; Bryan Mills. I loved both their styles, especially Paul’s. Still do.”  Together they recorded the album To Stars. After that, Bryan also played some lives with them in 2000. Then he went back in studio with Jacques to record a few songs, one of them, ‘Banished By The Underground, Haunted By The Overground’, released on the EP Roses For Ashes. During the recording of Regeneration in 2000, Bryan had a try at filming. His film, A Visual Record, was screened in 2001 at the Edinburgh Film Festival. In October 2001, Neil Hannon announced his decision to split The Divine Comedy, and Bryan Mills was no longer part of the band. Then 2002 started with Bryan playing live in the US for Violet Indiana, the band of Robin Guthrie (Cocteau Twins). Back in the UK, Bryan decided to get back to singing and formed The Kittens with his friend Nick Munro. They recorded an EP, Tiny Motions, one song from the record ‘Every Analogue Recording For Itself’ is also to be found on a Stolen Recordings compilation. Soon after, The Kittens started recording songs for an album with Robin Guthrie and violinist Fiona Brice. Although, the project never went finished. In 2003, Bryan recorded a song with Kevin Shields (ex-My Bloody Valentine) to feature the soundtrack of Sofia Coppola’s film Lost in Translation. Bryan and Ivor Talbot also worked again for several projects produced by Julian Simmons including Mougene and Anthony Reynolds’ albums Neu York and British Ballads. In 2005, Bryan produced the debut EP of a young band, Guillemots (Fantastic Plastic Records). He also helped other bands of their label including The Beat Up. Subsequently, the label released a split 7” single with Fyfe Dangerfield and The Kittens (‘Happy Christmas From The Kittens‎’). After a few years hiatus, The Kittens came back to the London scene in 2011, with Bryan moving to the accordion. They played several gigs at the Union Chapel, and they supported Emmy the Great & Tim Wheeler. Bryan has also recently provided accordion for The 99 Call’s Last Days single (Setanta Records), produced Nick Munro’s 7VWWVW (Mammal) debut album (KFM Records), and made soundtrack music for films by John Maclean (ex-Beta Band) such as Pitch Black Heist and Slow West. In the latter Bryan also appears in the movie as the Minstrel.